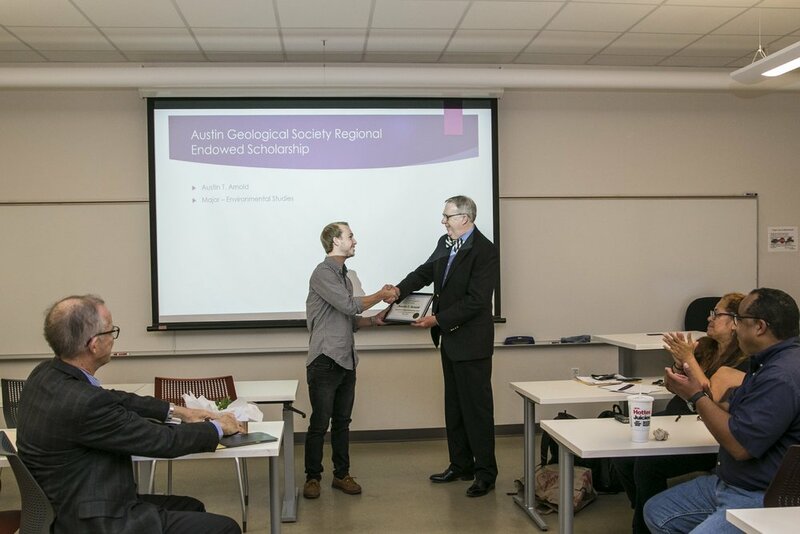 As part of the AGS mission to foster education in the Geological Sciences, AGS has been awarding scholarships to students since 1999. Awards are designed to be given out annually, but are conditional upon the funds gaining enough awardable income throughout the year. Please contact the scholarship committee chair Shane Valentine (Shane.valentine@gmail.com) with any questions. Students with excellent academics and financial need are nominated by Jackson School of Geoscience field camp faculty after taking Field Camp (Geology 660). Two $500 scholarships are awarded in the spring of each year to two University of Texas at Austin, Jackson School of Geoscience students. The Scholarship Selection Committee, composed of two UT Geoscience faculty and the AGS Endowed Scholarship Chair, evaluate the nominated students and select the recipients. The Scholarship is open to any central Texas geology student, but was devised primarily as a partnership between AGS and Austin Community College to help geology students of promise transition between ACC and a 4-year geology degree program (preference is given to UT Austin, but this is not a criterion). A $500 scholarship is awarded in the spring of each year. Students apply directly for the new Regional Scholarship. Awards are based on a single page narrative of need and future goals along with a minimum 2.5 GPA overall, submittal of STEM coursework for review, and staff recommendations. Austin T. Arnold receives the first-ever award from Will Boettner. Spring 2018.